The picture below showed up on Twitter the other day, but I didn't realize until just now that it was something I'd not actually seen before. Despite the fact that The Music of the Lord of the Rings Films has been circulating for almost two years now, I've never actually held a second printing in my hands. You'll notice that picture shows a golden ribbon bookmark protruding past the end of the book. This is actually a part of the book--something we were only able to include on the second printing. We thought we'd throw it in just to distinguish the two runs. (There's also a small change in the technical text identifying the second printing.) I approved the design change, but hadn't actually seen it until now. Quite fetching, if I do say so! By the way, Amazon continues to struggle to keep the book in stock. I think The Hobbit has increased the visibility quite a bit. If you've been holding off, don't hold off forever! We're not going to run dry any time soon, but available is occasionally an issue. An off-topic post, but a worthy cause. Next stop, post production ... and you know what that means! I had a bit of a go at the new Superman trailer on Twitter this weekend, but since genuine questions have arisen, I thought I'd address them here. First, yes, this is indeed the music from Gandalf's fall in Fellowship -- you're not hearing things. Man of Steel, like The Lord of the Rings, is a Warner Brothers production (New Line is a subsidiary of WB) so they're well within their rights to reuse the music as far as I'm aware. Second, it is unlikely in the extreme that this music will actually show up in the final film. Hans Zimmer is scoring Man of Steel, and he and his team tend to bring a strong personality to projects. Finalized films do occasionally work in borrowed compositions, but this is usually because the director used it in the temp and fell in love with it. Die Hard did this. The Star Wars prequels. Three Kings used an odd bit of Thomas Newman's Unstrung Heroes. There are some more recent examples I'm forgetting. But the director of Man of Steel recently announced that they will not be using the John Williams theme from the 70s in his film, so they're obviously trying to give it a new stamp. So why is this causing such a stir? Generally when a trailer repurposes a piece of film music, they chose something with a low profile -- something accessible, but not strongly associated with a particular narrative. The end of James Horner's Aliens showed up in action trailers for years. To this day, Randy Edleman's themes from Dragon: The Bruce Lee Story and Dragonheart are probably better known for their many trailer appearances than for their places in the original films. Gandalf's fall, however, is an iconic moment in a classic score from a famous film. Does it work here? Sure -- but you could put Shore's beautiful music behind a video of me eating breakfast and it would still be inspirational. It's just that powerful. Is it distracting in Man of Steel? Yes, probably. At least for those of use who have lived so closely with the music. But I bet it will sell a lot of tickets at the same time. A pair of upcoming LOTR performances made the news today. The Two Towers will play in Ireland on Sunday, October 28, 2012 when the RTÉ Concert Orchestra presents a Live to Projection concert in the O2. Details and tickets are HERE. But before that, the Shanghai Symphony Orchestra, Shanghai Opera Chorus and Shanghai Youth Choir will present Howard Shore's LOTR Symphony on Sunday, July 29, 2012. 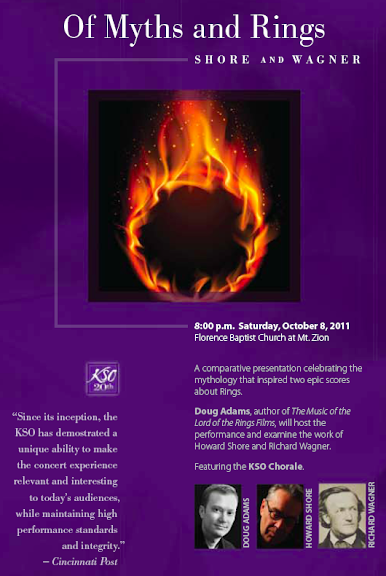 Details and tickets for that performance are right HERE. Sounds like a pair of pleasant Sundays! I will return to posting, emailing, tweeting, etc. in the next few days, but wanted to say a heartfelt "thank you" to everyone who sent good thoughts, well-wishes, and congratulations over the weekend. As usual, I'm overwhelmed by your kindness and generosity! (June 26, 2012—New York, NY) Howe Records is pleased to announce the release of the Soul of the Ultimate Nation (SUN) Collectors Edition Vol. 2 available in stores and digitally on July 10, 2012. The epic online fantasy game Soul of the Ultimate Nation (SUN) has been enjoyed by fans around the world, but the soundtrack had only been released in parts of Asia. Now for the first time, as the second in a Collector's Edition series of the Composer's work, Howard Shore's original score for SUN is available to a worldwide audience. During the time that Shore was writing the score for SUN he was at the Kremlin in Moscow conducting performances of The Lord of the Rings Symphony with the National Philharmonic of Russia and Victor Popov’s Academy of Choral Arts. Further concert engagements took him to Tokyo with these ensembles. "While in Japan, I decided I wanted to write the piece specifically for this orchestra and chorus," said Shore. "I wanted the chorus to sing in ancient Korean as a way to express the world of SUN. It seemed like the perfect opportunity to bring together the western and eastern concepts at play. The pieces were composed as tone poems to express the different characters, cultures and the world of this wonderfully detailed game." Howard Shore is among today’s most respected, honored, and active composers and conductors. His work with Peter Jackson on The Lord of the Rings trilogy stands as his most towering achievement to date, earning him three Oscars® and four Grammy® awards. Since 2003 Shore’s music from the beloved trilogy has been constantly performed in concert halls around the world. Shore’s on-going collaboration with filmmaker David Cronenberg has spawned scores for 14 films, including The Fly, Dead Ringers, Crash, Naked Lunch, Eastern Promises, A Dangerous Method and Cosmopolis. Shore continues to distinguish himself with a wide range of projects, from Martin Scorsese’s The Departed, The Aviator, and Gangs of New York, to Ed Wood, The Silence of the Lambs, Philadelphia, and Mrs. Doubtfire. He is currently working on his second opera, and is returning to Middle-earth with J.R.R. Tolkien’s The Hobbit. 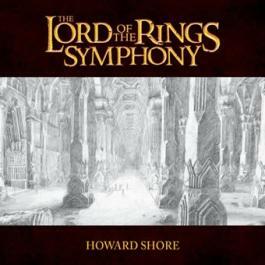 Howe Records recently released Howard Shore’s Academy Award® nominated score for Hugo, and a live recording of The Lord of the Rings Symphony, which spent many weeks on Billboard’s classical album charts. On July 10th, Howe Records will also release the Soundtrack for David Cronenberg’s upcoming drama Cosmopolis. Soul of the Ultimate Nation, Collectors Edition Vol. 2 from Howe Records will be available in stores and digitally on July 10, 2012.